Even though the rites and prayers are essentially the same, day in, day out, there are times when the Eucharist can spring surprises: when words or symbolic actions can move or inspire, or a hymn or reading seems to leap from the page with new meaning. As we settled down for the closing Eucharist of the Philippine Forum and were told we would be celebrating the jubilees of vows of ten sisters - a total of 375 years between them - that seemed enough of a surprise and an inspiration. But then one of the liturgy team handed me his phone. There's going to be a special ritual at the offertory, he said, asking if I could video it for him. I found out later he'd only heard about this a few minutes before Mass started, and was suddenly impelled to ask. In fact, only three or four people actually knew what was going to happen - for everyone else it was a complete surprise, moving the congregation simultaneously to tears and cheers; to gratitude and utter amazement and awe. I picked a good position, assuming the 'special ritual', on such an occasion, would be akin to a blaze of glory; a procession maybe, with symbolic gifts. But just as Elijah's God was not in the mighty earthquake or the fire, but in a gentle breeze (I Kings 19), so this ritual happened, not in fanfare and spectacle, but in stillness and simplicity; in something as everyday and unostentatious as one woman handing something to another. Two RSCJ stood in the centre, one holding a silver ciborium; the other, the US-Canada Provincial, with only the sketchiest idea of what she was about to receive. A third, at the lectern, read a letter from the Provincial of Venezuela, explaining the ciborium's history and significance. This was the ciborium given by Sophie to Philippine in 1818, as she prepared to set sail. It travelled with her on the Rebecca and up the Mississippi, disembarked at St Louis and took up residence in that cramped, primitive log cabin in St Charles. For the nuns, the creation of a chapel and the first Mass in a new house sealed its foundation, and this ciborium would have been at the centre of that founding moment - in this case, not just of a community, but of an entire mission and heritage; its contents, the very Bread of Life, nourishing and strengthening the nuns for the many challenges which lay ahead. 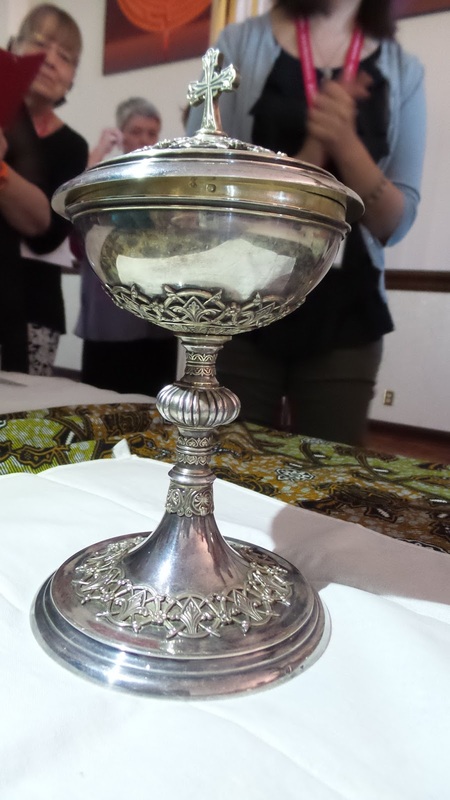 In 1858 the ciborium was sent to the new foundation in Cuba, where it spent the next century - though it seems that, over time, many religious became unaware of its Society pedigree. That's probably how Sophie and Philippine would have wanted it - that the ciborium should be treated with awe and reverence not because of them, but because of the divinity it held. From Cuba it moved, in 1961, to another new foundation, this time in Venezuela, remaining with the sisters even as they moved into the poorest and most marginalised barrios. Three countries, three new foundations: three missions in very different times and places, and at the centre of each, the same ciborium, fulfilling its own purpose and mission of holding the Body of Christ; holding, too, and nourishing, the spirit of fervour and audacity, of sacrifice, courage and generosity, of prayer and fidelity, of all those missionaries. All this and more was in this treasure, which the sisters in Venezuela were now returning to America, with much love and prayer, and in a spirit of generosity and Cor Unum which would surely have gladdened Sophie's and Philippine's hearts. And then - that simplest of gestures - Margot handed the ciborium to Sheila, and, as emotion and held breaths found their release in loud applause, she went over and placed it on the altar. And so the treasure was back, only a short drive from where it had begun its unique mission almost two hundred years ago. 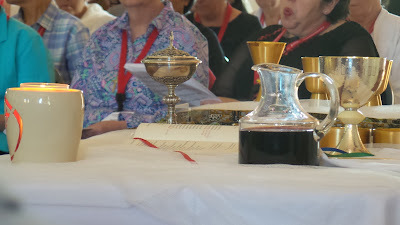 Unlike the other vessels it remained empty throughout Mass, but in reality it contained so very much, which spoke to us all of life and so many lives, given and lived to the full, for the glory of God and the love of his Heart.